Discussion in 'A Song For You: The Carpenters Forum' started by Chris May, Aug 6, 2013. John Adam, Bobberman, Don Malcolm and 7 others like this. ^^That was nice to read. "Passage is an eventful recording." That is a nice conclusion ! Jamesj75, Rick-An Ordinary Fool, goodjeans and 1 other person like this. Too bad the News footage of Passage recording session is (apparently) nonexistent. I remember reading about it in Billboard as a teenager. I either saw it in one of Randy’s articles in Yesterday Once More, or one of Chris An Ordinary Fool’s posts, if that is what you are referring to. Ed has reminded me that Joe Wissert was considered at one point for Passage Producer. this issue. How seriously was he considered for the "job" ? Was it simply a phone call ? Was he interviewed in person ? Certainly, we have never heard from Joe Wissert regarding his consideration. ThaFunkyFakeTation and goodjeans like this. "With Weintraub, Richard met with several producers...but, too many seemed in awe of his (Richard's) achievements." done to Richard in the studio." (Coleman, Page 217). (1) Who else was considered ? Those "several producers" ? future pull-out that Karen decided upon, with regards to the solo venture. This may require further investigation. I just pulled out the 1989 CD set of ANTHOLOGY and it sounds as if "I Just Fall In Love Again" has a higher degree of reverb on Karen's vocals compared with all of the other versions. Can this be a previously undocumented remix? Here's a Victoria Day surprise. A while ago I posted some pictures of a Canadian 45 of the Edited version of Calling Occupants Of Interplanetary Craft showing a Mono mix. Well, here's a link to that scarce Mono mix. The Mono mix starts about 4 minutes into the video, however, I included the stereo side as well for comparison. For the transfer, since I'm setup for video transfers, rather than audio-only transfers, I hooked my record player up to a Hi-Fi VHS (and I don't have the room for a record player near my digitizing station) and copied it to the VHS's Hi-Fi track, and then I digitized that with an ADVC-300 to provide me with a DV-AVI (DV uses a 16-bit, 48kHz 1.5Mbps) file that I then uploaded to YouTube. So if you hear any tape sounds or digital audio compression issues, its from either the tape or YouTube. And for the linear version I just turned off the Hi-Fi on the playback VHS so that I had a 1-channel Mono recording, since my record player has a stereo needle and I had the stereo outputs of it connected to the VHS, and I know some of you say that you can hear on mono records some stereo issues when played back with a stereo needle, but if you compress the audio to mono, the problems go away. And for the recording, for both stereo and mono sides I had the VHS recording at SP mode, so the linear will be at VHS's maximum resolution for linear audio. Seán Pendlebury, Don Malcolm and Jamesj75 like this. Thanks tomswift2002. That pretty well confirms my theory that any mono mix of the single was simply a fold-down of the stereo. Well I find that Karen's last "We Are Your Friends" is more clear and stronger in the mono version---but that could be because the stereo version has her trailing off to the left as the song ends, whereas in mono they had to keep her in the center. But with the mono I find that the guitars are more overpowering, whereas in the stereo mix, because of the wider soundstage, they are more spread out and not as overpowering. After closer examination, it has been determined that the ANTHOLOGY (89) version of "I Just Fall In Love Again" is the same standard album mix, but some EQ choices at mastering time has brought out some more enhanced-sounding reverb, noticeable near the start of the track. for a friend--who had never heard Carpenters' version. he asked why it had not been released as a Single. He believes it could have made a dent on the charts 1977 or 1978. I’d have liked to hear Karen sing this song. I know when she heard it, she regretted not having recorded the song herself. Really? I never heard that. for Karen, who declared " I should have done it !" as the record climbed the charts. She and many others had not registered it as such a potential winner." newvillefan and ThaFunkyFakeTation like this. I have that book and didn’t remember that. Wow. I’m glad she didn’t though. That would have made her hyper-uncool. Debby Boone never escaped the shadow of that tune either so maybe not the best choice for her either. Jeff S and Rick-An Ordinary Fool like this. I’m glad she didn’t though. That would have made her hyper-uncool. Even more than she already was? The Jp Anthology LP is really special. Adds to that special place in my heart for the Passage LP. I'm going to have to get my hands on that LP then. I love both those songs and anyway Karen's vocals can stand out more from the "busyness" surrounding her would be great to hear! for a friend-- he asked why it had not been released as a Single. Speaking of possible singles from 'Passage' that were hits for other artists, I just checked out chart action for 'Don't Cry for Me, Argentina' in the years around the release of the album. 'Don't Cry for Me, Argentina' was a Number One in Australia earlier in the year that 'Passage' was released, (see below), and was actually the biggest hit of 1977. It was also a Number One in several other territories including the UK, where it was the 3rd biggest hit of the year. 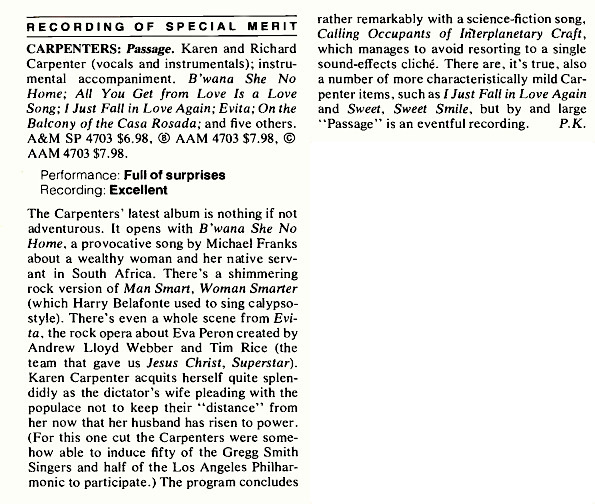 These sorts of sales for Julie Covington's version would have negated any thoughts of releasing the Carpenters' version as a single in most parts of the world, although it was not a hit in the US for any artist until years later. In Australia, it seemed odd to find a version of 'Don't Cry For Me' on 'Passage' when it was released towards the end of 1977, seeing as it had been a huge smash for Julie Covington earlier that year, had been played to death on the radio and seemed like an old and spent song. However, there was obviously still life in the song, and interest in it, because Olivia Newton-John had a minor hit with it in Australia in 1980, when her recording was three years old, (see below). Personally, I think Carpenters' version would have been too slow and long to be a hit, (even with the choir section edited off and even though Julie Covington's and Olivia Newton John's versions were also slow), although it might have been interesting to see how it would have followed 'Calling Occupants' in countries like Ireland, England and Australia if Julie Covington hadn't got there first. Since I felt like avoiding the surface noise, I had the idea of using the Gold DVD's 48khz 16bit audio track for 'Calling Occupants' - the cleanest 'single edit' available to me. I spliced the singles SACD's keyboard intro onto the track, and crossfaded them togeter (no Tony Peluso!). Here! Something I noticed as a result of this, was that the original mix with trumpeting was used in the Gold DVD, yet on the Interpretations DVD the more common remix with more reverb and less brass was used. I'd never noticed it before! Well VHS and Betamax’s HIFI have been compared to having close-to the same dynamic range and response as CD audio, whereas their linear mono tracks have been compared to being a little better than AM radio (and better than audio cassette). But with GOLD, it used the video master from 1985 that was made for the “Yesterday Once More”. ‘Calling Occupants wasn’t remixed till 1989. I preferred the original mix. From memory, the re-mix is thumpy and overly heavy on the bass.